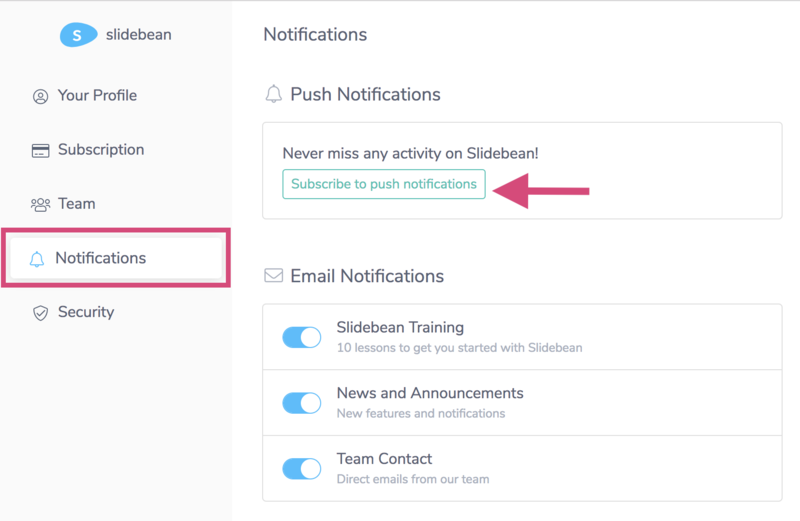 Be on top of viewers activity on your slides and learn how to manage Slidebean push notifications. Slidebean can notify you whenever one of your presentations has been seen, through your browser's push notifications. This will make it easier for you to stay on top of viewers activity on your slides, with Insights. To enable or manage these notifications, from your dashboard home page look for your name on the top right corner of the screen. Click on it and then go to "Settings". Once in your account Settings, go to Notifications. Here, it's as simple as Subscribing to Push notifications, and you can Unsubscribe here too. You could also manage this from your browser's settings directly, just in case, here's how to do it in Google Chrome and Mozilla Firefox. As of now, notifications are only available for Firefox and Chrome users and we hope to extend it to other browsers in the future.